THE SHOGUN WALLET One of the most devious, yet innocent switching wallets ever devised, is now available exclusively from Jerry O'Connell London. The Original ShoGun Wallet is now made by Jerry O'Connell London to his high standards of craftsmanship. Elbert Garner is a creative and brilliant inventor who, over the years, made many items for Al Cohen and the Magic Community. Through exclusive arrangements with Elbert we are now able to bring to you the finest and only authorized ShoGun Wallet ever made. We now own all the manufacturing and intellectual property rights to this effect and wallet. 1. Wallet shown empty and a selected card ends up inside. 2. A large banknote is paced in the wallet. Shake the wallet and the banknote is a smaller value. 3. A blank piece of paper is in the wallet, opened later revealing a prediction. 4. Blank piece of paper changes into a banknote. 5. A piece of stage money changes into a real banknote. 6. Can be used to switch one card to another. 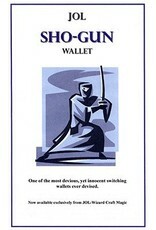 Conceived by Elbert L Gardner, the Shogun Wallet was an immediate success. "The possibilities with this fine prop are endless. Carry a couple of business cards or credit cards in the pocket to give it a more authentic look. Now, here's a routine that we've been using in the shop with much success: A person is given an opportunity to win some easy money. You bet him a pound or a dollar against his penny or a cent (100 to 1 odds) that you can cause his selected card to actually flip over in the deck. You apparently fail in your efforts, and when you go to give him the money, the selected card is found in the wallet along with the note. Thank him for his penny or cent as you take your bow." The renowned AL COHEN for generously offering his original instructions for inclusion. The very creative STEVE DUSHECK for sharing one of his favourite routines using the wallet. 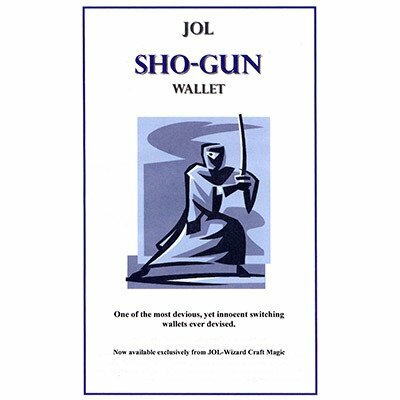 All rights to SHO-GUN Wallet and any variations are solely owned by JOL. There are a few unauthorized copies and variations on the magic market, please support the real deal, none have the quality standards JOL is well known for.